We are offering Colour Bio Wall to our client. We are offering Artificial Bio Wall. 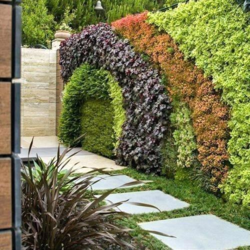 Bio wall is a perfect solution for landscape your wall..
Green wall is a new concept in India. Its a eco friendly and good for environment. It keeps our wall cool and protected from sun light without any side effect of water or plant. Price from Rs. 850 to 1150 sq. ft depending upon plant and location. Green Walls/Vertical Gardens/Bio Walls provided VertVista offer modules with Water Storage compartment, proprietary soil-less planting media, tissue cultured plants and maintenance expertize. 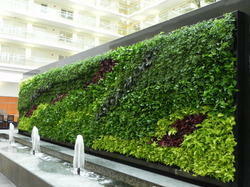 Our existing green wall projects stand as a testimony to our quality work and maintenance. Best price and client satisfaction guaranteed. Our company is providing Green walls / Bio Walls to our clients.